Camera already have better light sensibility, or even night vision. Digital screens for other side... Did I told you I refuse to watch movies on LCD or LED LCD backlight TVs ? Slim TVs killed my home movie entertainment. For me digital broadcast, at least in my country, it's a piece of crap, artefacts everywhere, detail loss, blur, banding instead of a natural degrade. This plus the garbage TVs itself, with motion blur due refreshing rate problems, problem with games due response time, angle view creating noticeable problems even in 10 degree (at least for me), venter bright than edges even if look 90 degree front, images got clipped for highlights and crushed for shadow, and if you try to reduce contrast to avoid it the image get pale and dull. It's like they homologate the TV and PC mnitor screen to a same contrast standarts. The first PC DVD kits had faded image on computer monitor, due difference contrast standarts from video made for TV and contrast of PC screens, and if we tried adjust contrast/brightness setting on software the whites tended to clipp and shadows tendency was to crush. now both displays (TV and PC monitor) have the same, I presume, and all films look faded if not adjusted to clipp whites and crush shadows. And I refuse to watch images with destroyed dynamic range. I refuse to watch it... And the advertises call such garbage of perfect image. I quit watch TV, that's it, digital technology destroyed television for me. I was banned from Home Theater Forum for make complains and spot the lies of this industry. I no longer watch films/movies, cause there is no good displays for salle, just garbage LCD/LEDs. I only watch clips on youtube, and even so not on full screen, just just a small window, cause full screen do not have a even image, since the edges are darker and the center are brighter. Last edited by All Darc; 04-03-2018 at 10:42 PM..
Can you imagine if in future, with most things drive and commanded by computer, and a super brilliant rackers could creat a super virus to turn the machines to make disasters. It would be like the Star Wars episode 3 massacre of Jedis. Yep, the switch to computers lead to new security problems. I would not want a society with too much computer control, we just need to get our humans in line. CRTs also give off lots of EMF, which leads to cancer. The "white holes" on face of actor in LCD TVs, where in CRT it was just bright areas and not white flat holes. The poor shadow rendering. The large square blocking in darker areas, the fine details (wrinkles,lines texture) vanishing evereytime anything it's not stead unmove... For me this is a deeply mess technology, a piece of s..., a lie. I boycott it, just that. It's like some samurai temple thing, where the best fermented soy went to the best warrior, or richier... The TVs don't work for sofa in all seats, an even for the watcher notice some center of screen brighter and are darker then center. A TV station technician confessed all that was there, there it was way no match to good Blu Ray (1080p) discs... Bad compression, poor bitrate, poor HD cameras. But other technician, not from TV, but one that went here... I confess I wanted to punch hin, since he just offended my intelligence saying like if the horrible image was normall. A image so poor in details like a S-VHS and plus the banding and artefacts, and he telling it was this way because it was not 4K. The withe holes cleary, and he saying it was the TV studio lights. And the worse of all, he telling that the heavy artefacted image had no video compression. My relatives got a 4K 50 inch LED TV, and I prefer to watch a 20 inch CRT over that garbage. It's true, I can't stand in front of the 4K LED, it make me sick, revolted, I can't stand it, it's a torture and drive me nuts, revolted, deeply revolted. It's worse in all aspects, all, except resolution. And even resolution it's a lie, since during motion you have blur from compression (in terms caused also by bad decoding processin and not just encoding compression bitrate) and the blur from refreshing rate problems. So it's a entire lie in all aspects. I don't uinderstand why people accept be made of fools, and there is no long CRT for sale. It's a holocaust of video entertainment. They finished it and replaced with garbage. I can't understand why this holocaust of dynamic range and holocaust of natural degrade happened without people complain. I will never watch a movie in a LCD/LEDbacklight screen. NEVER!!! Last edited by All Darc; 04-04-2018 at 12:36 AM.. There is no evidence to substantiate that claim, meaning there is no statistical health significance between high levels of CRT exposure and a control. I can't understand why this holocaust of dynamic range and holocaust of natural degrade happened without people complain. Because it used to cost $600 on sale to get 19" of VGA viewing. The display would take forever to turn on, consume a lot of electricity, and when you finally did want to get rid of the thing, you had to pay an extra disposal fee. I've got 2x 24" monitors that take up no desk space, very little electricity, and look good enough to do my work, and they cost $100 each. You can get OLED displays with excellent dynamic range, but those cost a lot still. My main TV is still a plasma from 8 years ago. I'll probably skip LCD and go straight to OLED once they come down in price. Either that, or TVs will go away and VR will replace it. Eventually visual signals will be produced directly in the optic nerve without any screen or light source. This could approach the resolution and refresh capabilities of the brain. Last edited by redpoint5; 04-04-2018 at 01:29 AM.. The story, set in a world where humanity lives underground and relies on a giant machine to provide their needs, predicted technologies such as instant messaging and the Internet. Last edited by freebeard; 04-04-2018 at 01:33 AM.. When I was a kid we had a TI 99/4A. 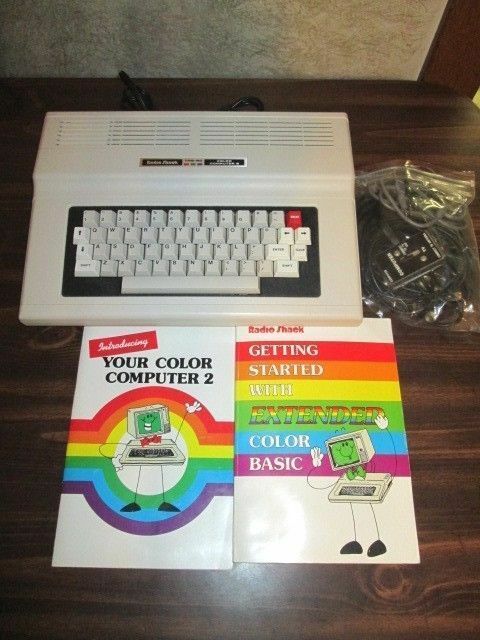 I remember my sister going through the owner's manual and changing colors and stuff. Dad bought an XT in 1989, so this was before that. I sure hope that is true. I spent a lot of time in front of crts, even a tv so big it had three in it. I was a CRT holdout for a long time, but truth be told, when I finally switched, I never looked back. CRTs are fuzzy, flicker, and when compared with a high quality panel IPS or -VA panel, don't render colors as accurately. They were also more expensive (both to purchase and ship) and power hungry. Certainly if you buy cheap garbage LCD panels you'll be disappointed, but it's not true to say that the technology is inferior. Perhaps not better in every sense, but better in enough ways that matter.